We recognized Memorial Day here in US this past weekend. A special holiday where we pay tribute to the soldiers who lost their lives serving in the military by standing around a BBQ grill complaining about how hot it is. It’s very moving. Luckily though, there are some great organisations like The Wounded Warrior Project that do some real good helping soldiers wounded in battle recover and transition back into something resembling a “normal” life (minus the complaining). Kevin Rogers is a stand up comic turned copywriter and now a copy chief. Kevin is also a best-selling author of The 60-Second Sales Hook. He created Copy Chief to bridge the gap between biz owners eager to improve their sales conversions and copywriters eager to show off their hard-won copy chops. This is a great example of commercial use of your 60-Second Sales Hook, Kevin. I actually saved this photo so I could keep it as a stellar example of the template in action, for such a great cause, too. Nice, Kevin. 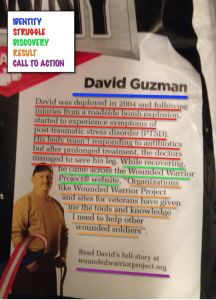 Thanks for sharing this – Wounded Warrior Project is doing great things! Like how the KLT is brief yet very clear. Very powerful indeed. I think I just found my new charity.